Link to other local Alaska businesses and/or groups that Planet Earth Adventures recommends. If you have a related Alaska business website and you would like to do a link exchange, email or call us. Our Adventure Specialists have the knowledge and expertise to help you arrange every aspect of your adventure, however some travelers enjoy doing a little research on their own. Here are some links to other local businesses and/or groups that Planet Earth Adventures recommends. If you have a related Alaska business website and you would like to do a link exchange, email your information to info@discoverak.com. We will consider your link based on its content. Alaska Bush Float Plane Service - is a locally owned floatplane service located 2 1/2 hours north of Anchorage in the small town of Talkeetna. Alaska Bush is a family-operated business that has been offering breathtaking Mt. McKinley scenic tours, memorable Alaska fly-in fishing excursions, successful hunting drop-offs, and exciting rafting and kayaking float trips for over 10 years. Our experienced bush pilots and guides are dedicated to providing safe flights and quality, friendly service on every trip. Alaska Conservation Foundation - A.C.F. works to ensure that Alaska’s inspiring expanses of tundra, internationally critical oceans and seas, breathtaking mountains, thousand-year-old glaciers, extraordinary rivers and lakes, and spectacular stands of old-growth temperate rainforest will retain their beauty and viability for generations to come. Scott Slone Photography - Welcome to Scott Slone Photography, the diversity of Alaska’s landscape is sought after by photographers and camera operators around the world, and now accessible to you through our new Alaska Photo Workshops and Tours! If it’s great Alaska images you’re seeking, I hope you’ll check out my Alaska Prints. ADN.com - The Anchorage Daily News has extensive coverage of the Iditarod Race and news from the Last Frontier. Anchorage Daily News newspaper in Anchorage offers you local news coverage online. Serving South-Central Alaska in Alaska, adn.com has local, breaking, weather, traffic, crime, sports and national news stories, articles and columns. Alaska Magazine - Alaska supersite for Alaska life and Alaska travel and all things Alaska. Alaska is a magazine devoted to news and discussion of issues and features of and from Alaska. Most of its readership consists of persons outside of Alaska who are interested in the Alaskan way of life. Anchorage Museum - The largest museum in Alaska, the Anchorage Museum is a community-based institution with exhibits and programs on the art, history and cultures of Alaska. Over 20 exhibitions are presented each year to more than 200,000 visitors. Alaska Native Arts Foundation - Connect online to learn about rich and diverse Native cultures and shop for beautiful, original artwork and accessories from Alaska Native artists. You can also visit the Alaska Native Arts Foundation Gallery, a fine arts gallery featuring contemporary and traditional Alaska Native artwork located downtown at 500 West 6th Avenue. Alaska Native Heritage Center - The Alaska Native Heritage Center is a gathering place that celebrates, perpetuates and preserves the unique Alaska Native Cultures, languages, traditions and values through celebration and education. Since opening in 1999, the Center has become Alaska's premier interactive cultural destination. Alaska SeaLife Center - Alaska’s only public aquarium and ocean wildlife rescue center is celebrating ten years on the shores of Resurrection Bay. Visitors to this “window on the sea” have close encounters with puffins, octopus, sea lions and other sealife while peeking over the shoulders of ocean scientists studying Alaska’s rich seas and diverse sealife. The Alaska SeaLife Center generates and shares scientific knowledge to promote understanding and stewardship of Alaska’s marine ecosystems. look and feel, their designs have evolved to reflect the uniqueness and diversity of this vibrant Copper River region. Dew Claw Kennel is home to Dan Kaduce, Jodi Bailey, and their kennel of Alaskan Huskies. They are a distance racing kennel located in beautiful Chatanika, Alaska. They are passionate about dogs, and addicted to mushing. At Dew Claw "a life lived with dogs" is not just a tag line, it is how Dan and Jodi live. Jodi explains, "From birth our dogs are with us and being prepared to be the most amazing canine athletes, with the best diet and care we can provide. We spend time daily, year round, working with and caring for our dogs, and the result is a relationship with them that allows us to accomplish great things." Eberhard Brunner - When Eberhard Brunner retired from his international alpine ski career, he left his native country Austria to accept the position as Alaska's first full-time ski racing coach. Eberhard fell in love with a land rich of splendor, challenge and beauty. As a guide and pilot, he has seen much of Alaska's backcountry, the villages and their people. Today, as a freelance photographer and writer, Eberhard has become the host and consultant for sportsmen and photographer visiting Alaska. His assignments have taken him to Africa, Asia, Australia, Siberia and Europe. Fairbanks Daily News-Miner - The voice of Interior Alaska since 1903. Serving interior Alaska. National, state, and local news, sports, dog mushing, ArcticCam webcam. G'day Charters is run by Captain Eric Cosmutto and First Mate Jan DeNapoli (Cosmutto). We are a husband and wife team and we love spending time in Prince William Sound in the summer. Eric has over 25 combined years experience chartering, fishing and exploring Prince William Sound. He holds an OUPV (six pack) Captains license with 50 ton Masters and Towing Endorsements. He is an electronics tech by trade. Jan is an avid photographer and a PA by trade having worked for over 17 years in Emergency Medicine, Remote Medicine Orthopedics/Sportsmedicine and Neurosurgery. Pollux Aviation has been Alaska’s largest and longest running Robinson helicopter operator for over 24 years. Pollux is a 135/133 certified and OAS qualified helicopter company based in Wasilla, Alaska. We offer Charter services, Marine Services with our boat and off-shore capable helicopters, Long-term contract discounts, External Load Capabilities up to 800lbs, Tours, and more. Ronn Murray Photography is a husband and wife team of accomplished and professional photographers with a combined 16 years of experience. Ronn moved to Fairbanks, Alaska in 2008 to manage the regional office for a national school portrait studio servicing the north half of the state, before launching his own Photography studio in January of 2009. He has become a well known commercial and Nature photographer in Fairbanks and loves the magic of Alaska and the people in it. Sea Fur Sewing is a small home based business located in Sitka, Alaska that specializes in high quality fur, custom crafted indigenous outerwear. Alaska Native artist, Robert Miller is from the Kiksadi Clan in Sitka, Alaska. His family has lived in Sitka, Alaska for hundreds of years. Sea Fur Sewing is carrying on a tradition that has been with our Tlingit people since the start of time. Susitna River Lodging - How would you like to vacation in a beautiful setting at the edge of a colorful Alaska town? Susitna River Lodging is the place. We are located in the historic village of Talkeetna, Alaska on the east bank of the Susitna River in a braided valley carved out by the last great ice age. Talkeetna Air Taxi - Mount McKinley Scenic Flights and Glacier Landings. Come on a Denali flightseeing tour and see one of the last wilderness areas untouched by modern man: over six million acres of open alpine tundra, wildlife, mile high granite gorges, ancient blue glaciers and endless icy peaks … let’s go! Talkeetna Roadhouse - The Roadhouse, built between 1914-17, is one of the oldest establishments still in operation on Main Street in "Beautiful Downtown Talkeetna." Our kitchen is open to the public and we've become famous for breakfast, hearty soups, homebaked breads and genuine frontier hospitality. Our bakery produces all sorts of treats each day such as pies, a variety of cinnamon rolls, cookies, cakes and brownies. Yukon Quest - Annual 1000 mile dog sled race run in February between Whitehorse, Yukon and Fairbanks, Alaska. Contains information on sponsors, volunteers, musher bio & race updates. Wherever you go, you'll find unique Alaskan products and crafts. 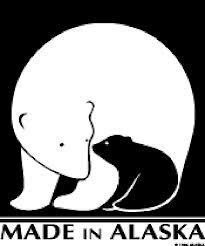 Be sure to look for the "Made in Alaska" logo, which indicates an item genuinely manufactured in Alaska. If you find this logo, it identifies the item as a Native Alaskan handicraft. Handcrafted items, made of walrus ivory and other by-products of subsistence hunting, provide an income source for Native Alaskan artisans and a valuable investment for the buyer. Be careful though - some wildlife products cannot be transported through customs without special permits. Visitors are advised to mail these souvenirs home to avoid confusion at the border. Link exchanges should be mutually beneficial to both parties. We often encounter situations in which webmasters requesting link exchange have a website not meeting our link exchange requirements or have not followed proper link exchange etiquette, thereby costing us considerable wasted time and effort. For that reason, we have established a link exchange policy to specify what type of websites we can accept and the type of link quality that we require. If you are submitting your website to us for a link exchange, it must be Alaska related. We don't create links just for search engine spiders. Instead, we regard links as important recommended content for our website visitors. We are proud of our website and constantly strive to improve the quality and content, so we are quite selective with respect to websites that we accept for our link exchange partnership. We constantly seek quality websites as reciprocal link exchange partners to benefit our visitors. Before you submit your website to our link exchange partnership, please take a moment to read and comply with the following partnership qualification and link quality requirements. View our Link Exchange Policy.